The Lower Falls Wine Co. will be holding a special wine tasting on Thursday, June 5, from 5-6:30pm. "The Piedmont (or simply Piemonte) tucked up in Italy's northwestern corner is a hedonistic vinous and gustatory playground. Grapes such as nebbiolo and barbera are the titans here. Piemontese wines offer lusty, earthy, lingering flavors which can be a pleasing departure from the cabernet-merlot axis. The Piedmont is officially one of winedom's hottest zones. Kerri and Phil spent a week in April knocking on cellar doors and came away highly impressed. A streak of strong vintages capped off by the stupendous 2004's has the wine scene buzzing. Over the years, we see better producers crafting "finer" wines showcasing seductive fruit and taming the shrillness of decades past. Some bottles taste positively "Burgundian"! These should be some excellent Italian wines and I highly recommend this tasting. I will be there, with a contingent of the North Shore Winers, so maybe I will see you there. I read several wine magazines and sometimes one issue has much more of interest than others. That happened recently with the May 2008 issue of Decanter, a British wine magazine. I already posted about a couple of intriguing articles from that issue, A New Pago and Who Collects Wine. I wanted to mention a few other articles as well. Chinese Whispers: This is a short editorial, by Sarah Kemp, about China and wine. It discusses some of the reasons why the Chinese buy and drink certain wines. "Chinese buy for face, not for taste." Spreading the Word: This is a brief article, by Steven Spurrier, about Indian and wine. Only about 1% of the country drinks wine, though that is still a market of 11.5 million people. Yet advertising alcohol is illegal so how do you market wine in India? Consumers in India lack much information about wine. Sounds like they could use a few good bloggers to help out. What Is Wine Writing For? : This is a brief article, by Linda Murphy, that discusses how wine journalists now seem to write more about mergers & acquistions and scandals than history and personalities. Has wine writing really changed over the years? Is it now more about scooping the competition? Morocco: Can Wine and Islam Mix? : This is a full length article, written by Rupert Joy, about the wine industry in Morocco and how it deals with Islam. It provides some history as well as facts about the current status of wine in Morocco. There are also some tasting notes for several of their wines. German Labelling: It's Simple, Honest: This is a full length article, written by Freddy Price, that gives excellent advice about how to decipher a label on a bottle of German wine. Prospecting for Minerality: This is a full length article, written by Jeff Cox, about the definition of "minerality." The term is often used to describe numerous wines. But what really does it mean? What is the taste of minerality? U.S. wine makers seem reluctant to use the term. Is minerality reflective of terroir? This is definitely a fascinating discussion. If you can find a copy of this issue, I highly recommend you pick it up! OurGlass Wine Co. and Chef Dave Ventola of the North End Cafe will be hosting a Spring Wine Dinner on Saturday, June 21, at 6:30pm. Herb Crusted Lamb Lollipops served over Field Greens with Vermont Goat Cheese in a Dijon Mustard Vinaigrette. The cost is $75 per person (which includes tax and gratuity). Contact Ourglass Wine Co. at 781-941-8068 to make reservations. My new column of "A Passionate Foodie" can be found in the May 28 issue of the Stoneham Sun newspaper. This is a weekly column that concentrates on reviews of local restaurants though it may also touch on a few other food and wine topics. The new column has been published today and will soon be available online as well. The new column is a review of Bin Ends, a new discount wine store in Braintree. This is a great place to find discounted wines from all over the world, from new items to inventory reduction, close-outs and more. This is like the Filene's Basement of wine stores. It is well worth the trip. There are still a few days remaining to enter my First Anniversary Contest! but the deadline is May 31. So if you wish to enter, you must act immediately. It is very easy to enter as you only had to add a comment with your name and email address. You could win a $100 gift certificate for food or wine. Who couldn't use an extra $100? The contest is open to everyone. Just go to the First Anniversary Contest website to enter, as well as to learn how to increase your chances of winning. Answer some questions, the answers found on my blog, and you could greatly improve your chances of winning. The general rule is that a Rosé should only be drank during the current vintage. Yet there are certainly exceptions. A fair amount of Rosés, especially good French ones, still taste good from the previous vintage. The Rosés from Domaine Tempier can usually last at least a few years. But who would think that a Rosé that is eleven years old would still taste good? Well, this past weekend I found an eleven year-old Rosé, from Spain. And this is a Rosé that was just released the prior year! It certainly intrigued me so I had to buy a couple bottles to taste. And I am very glad that I did. I found the 1997 R. López de Heredia Vino Tondonia Rosado Crianza ($25) at South End Formaggio. Around 1913 and 1914, Rafael López de Heredia y Landeta founded Viña Tondonia, the bodega´s most famous vineyard and product. Viña Tondonia is a beautiful vineyard of over 100 hectares, situated on the right bank of the river Ebro. They are a very traditional bodega and create some stunning wines. This Rosado is a blend of 60% Garnacha, 30% Tempranillo and 10% Viura. The wine was aged in the barrel for four and a half years, being racked twice per year and fined with fresh egg whites. The 1997 vintage was consided Good. The winery stated: "It is in vintages such as this one where the results of our viticulture experience and a top-level oenology gives us the capacity to deal with difficult situations and can have a result like this wine, still fresh 10 years later." The first telltale sign of the age of this wine is its color. Rather than a shade of pink like most Rosé, the color of this wine is more orange/copper. The nose is also different from most other Rosés. It has more of a smell of apricot and orange with spice notes, not the usual strawberry, watermelon, raspberry flavors. On the palate, it is a dry wine with an exotic blend of fruit, spice and other flavors, including a bit of butterscotch. It is definitely a complex wine where the flavors flit back and forth in your mouth, sometimes teasing you with familiarity before vanishing just as you were going to identify the taste. It is a smooth wine with a lingering finish. Such a radical departure from the usual Rosé but quite intriguing. Despite its age, it definitely has not lost any flavor. It has only become more complex and interesting. This is a wine I highly recommend. It is an unusual find and well worth its price. This is more of a wine lover's wine rather than something for the person just seeking a fruity Caifornia Rosé. Buy yourself a bottle and taste a truly superior wine. Once again, on my foodie trek through the South End, I stopped to eat. This time, my destination was Chocolee Chocolates, a new chocolate store that has been open for less than four months. The store is located on Pembroke Street, very near the intersection with Tremont Street. The store owner and chocolate maker is Lee Napoli, who has worked at or consulted for many local restaurants over the past 10 years including Icarus, Maison Robert, Grill 23, Anago, Metro, Bricco, The Buttery and Sandrine’s Bistro. She also established the region’s first and only association for pastry professionals in the 1990s, the Professional Pastry Guild of New England, and still acts as its head. She was at the helm of the store when I stopped by and was very personable. I could see the passion within her and was pleased. It is a small store with the one display counter that is pictured above. The store specializes in handmade truffles, available by the piece ($2.50). The chocolate truffles come in five signature flavors (espresso, hazelnut, white chocolate pistachio, Moroccan mint and spicy Poblano pepper). Some special truffles may be added at different times. The hazelnut truffle was excellent, with rich flavors and a creamy chocolate. The Poblano also had rich chocolate though the spices were very mild. I was hoping for a bit more kick from the spices. You can also purchase various chocolates, many filled with a diverse selection of flavors. You might find dark chocolate with salted caramel, dark chocolate with sesame caramel, dark chocolate with bourbon cherry and honey filling, and dark chocolate with coconut, chocolate turtles and more. Chocolates cost $12 for 1/4 of a pound. There are about 10 pieces of chocolate in a 1/4 pound. I bought a selection of different chocolates. The dark chocolate with salted caramel was probably my favorite, the salt, gooey caramel and chocolate just making a perfect combination. That first bite into the chocolate just blew me away. The dark chocolate with coconut was also very good, with a liquid-like coconut center. The turtles were another winner with a thicker caramel mixed with the rich chocolate flavor. The richness of the chocolate, its bold flavor, made these impressive chocolates. Everyone else who tried the chocolates was similarly impressed. On Saturdays and Sundays, you can also buy their beignets. For $7, you get three, golf-ball sized beignets that are filled with Callebaut chocolate and Mascarpone cheese. They are fried up as you wait so the interior of the beignet is guaranteed hot and melted. The beignets are decadently delicious. A nice crisp exterior with a rich chocolate center. And you better be careful when biting into them as the melted chocolate may ooze out all over you. The truffles, chocolates and beignets are pricey. That is certainly the norm now for all of the new boutique bakeries and high-end chocolate shops. The higher price of ingredients lately, such as flour, certainly is fueling some of the high prices. In the end though, we have to determine whether the quality of the product is worth the price. For some places, the prices are too high for what you get. So what about Chocolee Chocolates? To me, their products are worth the price. These are products that are impressive, as they should be for the price. They are not average quality items. They are chocolates and beignets that make you moan with delight. They have that "wow" factor that elevates them above the ordinary. So I would highly recommend you visit Chocolee. Another stop on my South End foodie trek was Sweet, a very new bakery that makes only cupcakes. They state that all of their frostings, fillings and batters are freshly prepared from scratch and made from the highest quality ingredients available. Cupcakes are available in regular size and miniature. The regular size are sized like a traditional cupcake and not the over-sized ones you see in some places. Prices for the cupcakes are not listed on their website. But they are not cheap. Regular cupcakes sell for $3.25 each, or 6 for $18.50, 12 for $36 and 16 for $48. Miniatures cost $2.35 each. This places their prices on the highest end of the cupcake market. For example, regular cupcakes at Kickass Cupcakes are $2.75 each and their supersize cupcakes are $3.75 each. I tried a Sweet Cake with vanilla frosting and a Dark Chocolate with chocolate frosting. They both tasted good but were not exceptional. The cupcakes were not as moist as they could be, though the frosting helped overcome some of the dryness of the cupcake. The frostings were very tasty, nicely sweet without being cloyingly so. They do provide a generous amount of frosting. But, at this price, the cupcakes should be impressively delicious, and they just do not reach that height. Now, they have only been open a short time so some leeway needs to be granted to them. I will try them again in another month or two to assess if anything has changed. They just may need to work out a few kinks. Time will tell. As part of our foodie trek through the South End this past weekend, we choose to have brunch at the The Beehive. The Beehive has been around for only one year but has become a very popular destination. The Beehive got its name and inspiration from La Ruche (French for "beehive".) La Ruche was an artists' residence in the Montparnasse Quarter of Paris in the 1920s. It was an old three-story, circular structure that received its name because it looked more like a beehive than a residence for people. The Beehive is a Bohemian-style bistro located, in a former boiler room, below the Boston Center for the Art’s Cyclorama. Chef Rebecca Newell has designed an eclectic menu of rustic comfort foods infused with American, European, Mediterranean, and Middle Eastern influences. They serve dinner and weekend brunch. The restaurant has two floors. The upstairs has a bar and numerous tables though the heart of the restaurant is the lower level. The upstairs area is not as decorative as the downstairs. The downstairs area is quite spacious and decorated in a Bohemian, jazzy, funky style. Fancy chandeliers, large thick curtains, intriguing artwork. A fun ambiance that seems fitting for this bistro. There is a small stage for live music and a band just started to play near the end of our brunch. I can see how this would be a hot spot at night. The Brunch menu has plenty of interesting choices so it took a little time to decide on what to order. We decided to begin brunch with the Beignets in a Basket ($4). Four, hot beignets that were about the size of lemons and dusted with powdered sugar. Very good with a bit of a crunchy exterior but a soft, moist interior. We finished them off as they were so good. Though they might have been even better with a dipping sauce, such as some melted chocolate or vanilla cream. I then chose the Short Rib and Fontina Grilled Cheese Sandwich ($13). It normally comes with cole slaw but they substituted that with some Frites for me instead. The sandwich is made from thick Texas toast, buttered and grilled, with plenty of melted Fontina cheese and thin tender slices of beef. It was an exceptional sandwich, flavorful and buttery. The meat was so very tender which also contributed to the excellence of the sandwich. It was also a good sized sandwich. I would highly recommend this sandwich! The frites that came with my sandwich were home-made potato chips which delighted me. I would almost always prefer that to french fries. The potato chips were delicious with just the right amount of salt. My wife ordered the Eggs Shakshuka ($11), which consists of three eggs baked over North African style tomato sauce and served with creamy polenta. It also came with two crunchy pieces of pita. This was another excellent dish with an intriguing sauce that was very unlike an Italian tomato sauce. The eggs, polenta and tomato sauce made a nice blend of flavors and it came in a good-sized dish. All of the other dishes I saw delivered to other tables seemed quite large too. Service was very good. Our server was personable and accomodating. Overall, I was very impressed with the restaurant and brunch. I will definitely return for brunch again and will try dinner as well. Their comfort food is very well done and is sure to please. I think prices were reasonable for the quality and quantity of food we received. So you should check out The Beehive. The weather was just perfect today: clear, sunny and with a light breeze blowing through. We took a drive into Boston, to the South End on a foodie trek. We hit a few new places, as well as a couple favorites. One of our stops was Stir, a demonstration kitchen and cookbook library owned by the famed Barbara Lynch. It is located near Plum, the Butcher Shop and B&G Oysters. It is a small place, with a wall of cookbooks on the left wall and the rest of the place is the kitchen. They have quite a large collection of food and wine books, some which can be found in any bookstore as well as more specialty items that are much harder to find. I enjoyed perusing the titles and eventually selected a book on biodynamic wines by Nicholas Joly. I definitely will return in the near future to purchase some other books there. The kitchen generally seats ten people. On Monday nights, they have a dinner that features wine, spirits or beer. On Tuesday nights, they have classes on various cuisines. The average cost of a class is about $125. They had their spring calendar available and mentioned that everything was basically sold out currently. So this is obviously very popular. The list of classes certainly covers many different cuisines and topics from Sustainable Seafood to Umami, from The Whole Pig to the Flavors of Provence. I will have to keep my eye open for their summer class schedule. You can also arrange for a private event here, including private dinner parties, cooking classes, wine tastings and corporate events. Over the weekend, we went out to dinner with another couple to celebrate a birthday. Our destination was Ruth's Chris Steakhouse, a chain that started in New Orleans over 40 years ago. But it is a rather new addition to the Boston restaurant scene. Though everyone else in our group had been there before, it was my first trip. Ruth's Chris Steakhouse occupies the site of the former Maison Robert. They have valet parking so we did not need to worry about parking. As we were early for our reservation, we first went to the bar for a cocktail. The bar is spacious, with a long bar, and numerous tables. It is elegant though not pretentious. It was not yet busy so the noise level was low. I tried their Fusion Martini ($12.50), which is a mix of Belvedere Lemonessence and Belvedere Vodka with a touch of fresh lemon sour. Ruth's Chris created Belvedere Lemonessence, a liquer using Belvedere Vodka and the freshest of lemons. Martini prices are comparable to other high end bars in Boston. This Fusion Martini was quite delicious, like an excellent lemonade. You really could not notice the alcohol which was either because there was not much in it, or the Lemonessence masks the taste. Everyone else also enjoyed the Martini. It makes for a refreshing cocktail, especially during the summer. We were later seated in a small dining room near a window. They have multiple dining rooms which disguises the true size of the restaurant. This is conducive to a more intimate atmosphere. Our window looked out into a historical cemetary, which did not bother anyone at our table though I am not sure all diners would feel the same. I did not pay much attention to the wine list as I had brought a few bottles of my own. Ruth's Chris allows you to bring your own wine and charges a $25 corkage fee, which I consider reasonable. I ended up bringing a bottle of 2005 Sea Smoke Southing Pinot Noir, 1995 Remirez de Ganuza Gran Reserva Rioja, and a 2003 Dolc de L'Obac (dessert wine). And when we received the bill later that evening, they only charged us a total corkage of $25 rather than for each bottle. Our server handled the wine very well, decanting the Rioja and keeping the Dolc on ice. The food menu is generally typical for a steakhouse, though they have plenty of seafood and other entree choices such as Veal Chop and Stuffed Chicken Breast. Entrees are ala carte and side generally can serve two or three people. Prices are comparable to other high end steakhouses in Boston. We decided to begin our meal with the Veal Osso Buco Ravioli (about $14) and the Seafood Tower for four ($110). The Ravioli are saffron infused pasta filled with veal osso buco and fresh mozzarella cheese. It is served with sautéed spinach and a white wine demi glace. You receive five large ravioli and they were exceptional. An excellent melange of flavors with plenty of meat in a savory, light sauce. I would highly recommend them. The Seafood Tower was a massive plate of raw seafood, including about 10 oysters, four Alaskan King Crab legs, four pieces of Maine lobster (couple claws and tails), four jumbo shrimp and scallop ceviche. It came with drawn butter, cocktail sauce, lemon and fresh horseradish. The seafood was very fresh, tender and delicious. The crab was nicely sweet and the shrimp were quite large. The ceviche seemed to have pieces of ahi tuna in it and the citrus flavors complemented the seafood. There was plenty of food but we basically devoured it all. The King Crab legs were a menu special and you could get them as a side for any meal for an extra $31. For dinner, I chose the Cowboy Ribeye (around $45). My wife also had the Cowboy Ribeye and the other couple had a Filet Mignon, with a side of Crab Legs, and the Veal Chop. We then got a couple sides, the Potato au Gratin and Sauteed mushrooms. All of their steaks are USDA Prime cut and are seared at 1800 degrees and topped with fresh butter so they sizzle all the way to your table. My ribeye and the filet were both excellent, good-sized pieces of beef with plenty of flavor. My ribeye had their Bleu Cheese crust which was a good choice, with the pungent cheese making a nice contrast with the beef. The other ribeye and the veal chop were not as good, the meat being a bit tougher. There was a noticeable difference between the ribeyes. The veal on a prior visit had been superb. So, half the entrees were excellent while the other half was good bit could have been better. Both sides were quite good. The Potatoes were cheesy and creamy and we finished the entire bowl. The mushrooms too were a big hit. For dessert, we shared a Caramelized Banana Cream Pie and the Bread Pudding. As it was a birthday celebration, the birthday girl's dessert was free. A nice touch. The Pie was a creamy white chocolate banana custard in a flaky crust and topped with caramelized bananas. It was sinfully delicious with a rich banana flavor, a creamy custard and a thin flaky exterior. Definitely something I would order again. The Bread pudding came with a Whiskey sauce and it too was very good. Though it contained black raisins, which I don't like. I did taste some without the raisins and though the bread pudding was very tasty. Service was exceptional. Our server, Andre, did an excellent job. We wanted to take our time and enjoy the evening and he never rushed us. He was personable, gracious and very accomodating. The rest of the service staff did a very good job as well. Ruth's Chris has many things going for it, though the fact two of our entrees were not as good as they could of been does put a bit of a damper on my recommendation. The appetizers and desserts were excellent, as were two of the entrees. Their corkage policy is also a big plus in their favor. Service is also another plus. So, I would have to cautiously recommend it with a caveat. I will likely try it again to see how it measures us on a second visit. The 2008 Penin Guide To Spanish Wine has recently been released in the US. It is considered one of the most definitive books on Spanish wine. The Penin Guide is is a trade-sized paperback book and has only been available in English for a few years. I have copies of the 2006 and 2007 guides and think they are excellent books. The 2008 Penin Guide is smaller than the previous two editions. The previous editions had about 175 pages at the start of the book that formed an educational section on wine in general, with some specifics on Spanish wines and their history. That was largely omitted from the 2008 edition. This omission does diminish some of the value of this book, especially if you are relatively new to wine. The rest of the book consists of thousands of wine reviews and listings for the wines and wineries of Spain. It also provides information of the current vintage in Spain and specific information on each D.O. In these areas, the 2008 edition is larger. It contains about 600 more wines that were tasted, about 160 more wineries, and almost 3000 more brands reviewed. The price of the 2008 edition has also risen. The 2007 edition was $36 but the 2008 edition retails for $45. You can buy it though online at Barnes & Nobles for only $36, and more if you have a membership there. It is getting pricier so the casual wine lover probably would not want or need this guide. But, if you really love Spanish wines and want more specific information about Spain and its wineries, then this guide might be worthwhile to you. I have been dining at the Hardcover Restaurant in Danvers for many years. It has consistently delivered very good food and usually has excellent service. Last weekend, I stopped there again, though it had been many months since my last visit. It is a large restaurant, though it has a number of different rooms so it seems smaller than it is. My favorite area is to the right of the entryway, a small, intimate room with a fireplace. This is a nice romantic area and highly recommended. Their menu has not changed much over the years, but it has not really needed to change. It is a steak and seafood restaurant, though with an emphasis on the steak. Prices are reasonable, and cheaper than the typical high-end steakhouses. All meals come with their all-you-can-eat salad. You go up to one of their several salad bars and make up your own salad. They have plenty of veggies with several different dressings. There is also fresh French baguettes and a huge hunk of cheese. I like their salad bar as I make make a salad with just the veggies I enjoy. Plus the bread is quite tasty, and sometimes is still even hot. We began our meal with an appetizer of escargot. This was on their specials menu, but then it has been on the specials menu for years. It is also one of my favorite escargot dishes anywhere. You receive six escargot, each covered in a thick layer of melted cheese and in a garlic & butter sauce. Absolutely delicious. And you can dip your bread in the remaining garlic & butter sauce. For dinner, we got the Sliced Sirloin for Two. This costs about $42 but you get 28 ounces of sliced sirloin, accented with seasoned butter and served on a sizzling hot platter. For that much beef, you are getting a very good deal. Plus, the sirloin has very little excess fat and is tender and flavorful. There is so much meat that you might even need a doggie bag to take home leftovers. I have ordered this dish several times and it has always pleased me. With your meal, you also get a choice of baked potato, rice pilaf or veggies. We passed on dessert (though I would recommend the fresh fruit parfait). I guess we just had too much beef. Service was ok, though not up to the usual standards. Generally, the servers are very professional. Our server though was not quite up to par. He was more casual, including making a joke about movies where the killer uses an icicle. I know that such service is not the norm here though. He was not a bad server, just a bit different from the norm. I do recommend the Hardcover. The WGBH auction will be ending soon, on May 31. As I mentioned previously, there are numerous food and wine items up for bidding. They have had gift certificates to places like Union Oyster House, Blue Ginger, Top of the Hub, Bistro 5, Teatro, Tasca, and many more. I have been bidding on a number of items, though I have not won anything yet. There is still time to win though. Plus, on May 31, from 3pm-11pm, WGBH will be holding a live auction on air on WGHB 2. That will be your final chance to bid on any of their interesting food and wine items. So check it out, and just don't outbid me on anything I want. On a recent visit to the Lower Falls Wine Co., I came upon a Spanish wine made from a grape I had not had before, and which I was not even sure I had ever heard of before. So I bought a couple bottles, just to try something different. 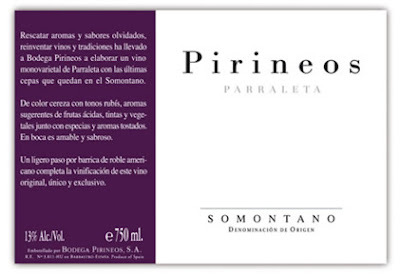 The 2004 Bodega Pirneos Parreleta ($16.99) comes from the Somontano D.O. in Spain. Somontano is located in the northwest of Spain, in the Huesca province. It is located between the foothills of the Pyrenees and the Ebro valley. The word "Somontano" translates as "under the mountain." Local wine stores don't carry many wines from this region though that is slowly changing. Bodega Pirineos, owned by the Barbadillo family, was established in 1993 in Barbastro. They produce wines made from both indigenous Spanish grapes as well as more international ones. Parraleta is a rare red grape that is indigenous to Somontano. Parraleta is a small bunch variety of medium compactness. The grape is medium-sized with bluish black skin and a short stem. don't confuse this grape with the Spanish Parellada, a white grape often used in making Cava. The 2004 Bodega Pirneos Parreleta is made form 100% Parreleta, the vines being over one hundred years old. It is fermented using traditional techniques and undergoes malolactic fermentation in new American oak, before being aged for another six months. It has an alcohol content of 13% and only about 1000 bottles were produced. The wine has a rich, dark red color. Initially it had a closd nose and seemed very tight on the palate. But, as I let it sit for awhile, it began to open up. I would suggest allowing this wine to breathe for at least an hour, if not two to three, for it to reach its potential. Once it did open up, I was pleased by what I found. The nose had acquired some raspberry and black cherry with a touch of spice. On the palate, the berry flavors mingled with some pepper, cinnamon and vanilla. It did present a kind of dusty flavor as well, an added level of dryness, which made for a unique flavor. The wine does have noticeable tannins which make this more a food wine. I was having lamb steaks that evening and the wine made a great pairing. Overall, I very much enjoyed this wine, especially paired with the lamb, and would recommend it as a Drink & Buy. Italian wines occupy about 20% of my wine cellar. Only California and Spanish wines occupy a higher percentage. I am fortunate that many different Italian wines are available in my area, including some very small and traditional producers. Yet there is still much I want to learn about Italian wines. There are so many indigenous grapes that I have yet to taste. I am always looking for ways to further educate myself about Italian wine. 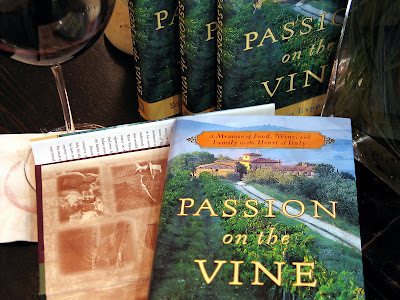 I recently received a review copy of Passion on the Vine: A Memoir of Food, Wine, and Family in the Heart of Italy by Sergio Esposito. This book was recently published by Broadway Books, an imprint of the Doubleday Broadway Publishing Group which is a division of Random House. It consists of 285 pages, broken into fourteen Chapters and an Epilogue. The title obviously appealed to me with its emphasis on Passion. Yet would I find true Passion within those pages? The subject matter drew me in as well, my hopes that I might learn even more about Italian wines. As I began to read the book, I became hooked from the very first chapter. Passion on the Vine has an easy reading style, very descriptive and with an intimate touch. It is well written and the language can sometimes be poetic. It is educational but never preachy. It presents Sergio’s opinions and thoughts in an appealing manner. It was a real pleasure to read. And I certainly found much passion within it. Sergio currently owns, in conjunction with Chefs Mario Batali and Joe Bastianich, a wine store in New York City called Italian Wine Merchants. Founded in 1999, this store sells only Italian wines and is dedicated to selling the best that Italy has to offer. Sergio frequently travels to Italy on wine buying trips, and much of the book is devoted to descriptions of a couple of those trips. We then get to meet numerous wine makers, from all over Italy, including famed individuals such as Enrico Scavino, Valentino Migliorini, Giuseppe Quintarelli, Josko Gravner, and Bartolo Mascarello. The book is also part biography, describing Sergio's childhood in Barra, a suburb of Naples, during the early 1970s. We learn about Italian culture, the importance of family, food and wine. When Sergio was 6 years old, his family moved to Albany, New York, for financial reasons. There was much culture shock as Albany seemed so radically different from Italy. Though this is also the time when Sergio first began to love wine. Who would have thought that the movie One Flew Over The Cuckoo’s Nest, one of Jack Nicholson’s best films, would move Sergio even closer to food and wine? To understand that, you will have to read the book. By the summer of 1998, Sergio had developed plans for his dream, an Italian wine store devoted primarily to traditional Italian wines. He felt that we would find great wines by finding great producers, those wine makers who were passionate about wine and who were not just seeking to make money. That is certainly a philosophy dear to my own heart. I fully agree that it is those passionate individuals who most often bring about greatness. Italian Wine Merchants then opened its doors in October 1999. Like Alice Feiring, though certainly not as confrontational and controversial, Sergio prefers traditional wines to more modern style wines. He is supportive of biodynamics as well, feeling that such wines just taste better. Terroir, or territorio, is very important to Sergio. Wine should taste of the place where it is made, giving it its own uniqueness. He feels that the traditional Italian wines he prefers are not “Parkerized” wines, that they are unlike many of the big, bold wines Americans are used to drinking. And nearly all Italian wine should be drank with food. Sergio though does sell some modern style wines in his store, though primarily as a gateway to get people to try more traditional wines. Much of the book is devoted to a wine buying trip to Italy that Sergio took with his parents in 2004. During this trip, they traveled to many different regions, meeting many different wine makers, as well as attending Vinitaly. Throughout this section, there is plenty of information on Italian culture, especially their food and wine. Sergio provides enticing descriptions that make you want to visit Italy. The personalities he encounters are compelling. You certainly won’t be bored. I was especially intrigued by the modernist Luca Maroni from Montalcino who invented his own rather bizarre and complex wine rating system. For Luca, Quality=Pleasantness=Fruitness. This Q/P/F is composed of Consistency + Balance + Integrity. The top possible rating is 99 points though you need algebra and a conversion table to figure out each specific rating. I don’t think that this rating system will ever become too popular. My only complaint about this book was it seemed to end too suddenly. I wanted a more satisfying resolution. Maybe I wanted to know more about how his parents felt after their lengthy trip to Italy. But this is a minor flaw in an otherwise excellent book. I definitely recommend this book to both food and wine lovers, especially if you have any interest in Italy at all. It is a compelling read which should please. It has also motivated me to visit Italian Wine Merchants when I visit New York City this summer. You can look forward to a future report on that visit. This past Saturday, after attending the Spring Grand Wine Tasting at Grapevine Travelers, I led other members of the North Shore Winers to another Grand Tasting at OurGlass Wine Co. in Saugus. This Grand Tasting had 12 different vendors (11 wine vendors and 1 beer vendor) and there were over 70 wines available for tasting. After having already been at one major tasting, I could not taste all of the wines at this tasting. But I will tell you about my favorites of those I did taste. I am sure that I missed some other very good wines. I have attended several of these Grand Tastings at OurGlass, enjoyed them all, and they are also very popular with my wine group. There was certainly a diverse selection of wines available, many geared specifically for summer. Besides all the wine, there was cheese, salami and more snacks to nibble on between sips of wine. I will list my favorites by the distributor so that if you cannot get to OurGlass Wine Co., you might be able to find these wines elsewhere. Anyone who reads my blog knows that I am a major fan of Adonna Imports. They have an excellent portfolio of almost all Italian wines. It is always a pleasure to see what new wines they have brought. 2005 Castel Noarna Nosiola ($16.99): I recently reviewed this at another tasting. 2003 I Clivi Galea ($23.99): I recently reviewed this at another tasting. 2004 Bianco Aldo Vendemmia, Barbaresco ($39.99): A light colored red wine with great fruit flavors and a complex melange of tastes. Very Old World style and a pure delight. Lingering finish and a perfect wine with food. 2006 Zabu Insolia ($10.99): This Sicilian white wine is made from the Insolia grape. Nice citrus flavors, a touch of minerality and plenty of acidity. A good value wine. 2006 Zabu Nero d'Avola ($10.99): Another Sicilian wine, this time a red, that is light and fruity, a nice summer quaff. 2006 Ipsum Rueda ($9.99): A value wine from Spain. A crisp, fruity white wine with a bit of minerality. Plenty of character for the price. 2006 Vinos sin Ley "G-5 Puerta Bonita" Garnacha ($14.99): A Spanish red wine from Madrid that is 100% Garnacha. Nice dark berry flavors with a touch of earthiness. Smooth and has a decently long finish. Good BBQ wine. 2007 Arabako Txakolina Xarmant ($14.99): I love Txakoli wines from the Basque region of Spain. They are light, fruity and have just a touch of effervescence. A refreshing drink that goes well with many different foods. If you have never tasted a Txakoli, then definitely check it out. 2005 Joan d'Anguera "La Planella" ($21.99): Another excellent Spanish wine that is a blend of 40% Mazuelo, 20% Syrah, 20% Cabernet Sauvignon and 20% Garnacha. An interesting wine with plenty of fruit and spice flavors. Not too tannic or heavy. 2006 Nasiakos Moscrafilero ($14.99): This is a Greek version of Sauvignon Blanc but without the grapefruit flavors. Nice citrus flavors in a crisp, refreshing wine. 2006 Palicou St. George Red ($14.99): Another good Greek wine, a red with good cherry and strawberry flavors and a touch of minerality. An easy-drinking wine sure to please. 2004 Engelbrecht Ells Red Blend ($39.99): This is a blend of 50% Cabernet Sauvignon, 23% Shiraz, 12% Merlot, 5% Petit Verdot, 5% Cabernet Franc and 5% Malbec. A little bit of everything. This is a powerful, spicy wine with dark berry, ripe plum and chocolate flavors. A lingering finish that satisfies makes this quite a delicious wine. 2004 Spier Vintage Selection Shiraz ($11.99): Bacon! A bold, muscular Shiraz from South Africa with plenty of spicy and bacon flavors. A wine not for the meek. 2004 Spier Private Collection Pinotage ($24.99): Another South African wine that is a milder style of Pinotage, not the earthier type. It has more subtle spice and dark fruit flavors. A mellower wine that was smooth and enjoyable. 2005 Atteca Armas ($49.99): This is the single estate version of the Atteca. And it is everything that the Atteca is, but elevated several degrees. An intriguing, complex wine with a long finish. If you like the Atteca, why not splurge on this. My new column of "A Passionate Foodie" can be found in the May 21 issue of the Stoneham Sun newspaper. This is a weekly column that concentrates on reviews of local restaurants though it may also touch on a few other food and wine topics. The new column has been published today and will soon be available online as well. The new column is a review of The Ginger Pad restaurant in Burlington. This Asian Bistro is inexpensive, gives you plenty of food, and it is delicious. An excellent fast food option. Have you tried Beija yet? Beija is a new Brazilian Cachaca, also known as a virgin cane rum, that I think is great just on the rocks or mixed in any number of cocktails. You can sample this new liquor at a party that is being hosted by Beija at the Alibi Lounge at the new Liberty Hotel on Sunday, May 25, at 9pm. Come kick off Industry Sundays at Alibi with Beija Virgin Cane Rum! RSVP to Kevin@Beija.net or VIP@Beija.net to receive VIP privileges. Feel free to invite guests. Dress to impress. If you have any questions, please email me at Kevin@Beija.net. Sandrine's Bistro in Cambridge has a number of new menu items for the Spring plus a couple of upcoming events that might be of interest. June 21: Sandrine’s Bistro celebrates the first annual Make Music Harvard Square event on the summer solstice with talented local musicians performing al fresco al over town, and especially on Holyoke Street. See their website for details and matching prix fixe menus, or learn more about the entire day's festivities at www.harvardsquare.com. July 14: Sandrine’s Bistro will host THE Bastille Day party in Cambridge this year with an ultra-authentic French menu priced at just $25 per person all day. Decorations, music and a champagne cocktail called BluBlancRouge will be featured. Reservations recommended. As a bonus, here is a special new cocktail provided by Sandrine's Bistro. The French Night: A summer cocktail with a kick. Shake all three liquors together with cracked ice. Strain into a chilled martini glass. (You can check out my recent review of Sandrine's Bistro). There is still time remaining to enter my First Anniversary Contest! But the deadline is May 31 so time is dwindling. If you wish to enter, take action fast. It is easy to enter and you could win a $100 gift certificate for food or wine. Who couldn't use an extra $100? The contest is open to everyone. Just go to the First Anniversary Contest website to enter, as well as to learn how to increase your chances of winning. Over the weekend, I and some other members of the North Shore Winers attended a Spring Grand Wine Tasting at 2 1/2 Year Anniversary Party at Grapevine Travelers in Medford. This was the first of two Grand tastings that I would be attending on this day. Thus, my time was a bit limited though I think I did an admirable job in tasting a good selection of wines. This Grand Tasting had 13 different vendors (12 wine vendors and 1 beer vendor) and there were over 70 wines available for tasting. I actually ending up tasting about half of the wines. So let me list my favorites of what I tasted. As I did not taste all of the wines, I am sure there were other very good wines that I missed. If you did not attend this Grand Tasting, you missed out on an excellent opportunity to taste many new wines. I have been to several of the Grapevine Travelers' Grand Tastings, and they always excel. I will list my favorites by the distributor so that if you cannot get to Grapevine Travelers, you might be able to find these wines elsewhere. Though some of these wines may only be available at Grapevine Travelers. Violette carries some excellent organic wines and I am always anxious to try whatever new wines they have to offer. This tasting was no exception. 2005 Coturri Rosé ($24.99): The Coturri Winery is one of my favorite organic producers and they have recently produced two new additions to their portfolio, including this Rosé. This Rosé is a blend of 50% Pinot Noir and 50% Carignane. It has a powerful, fruity nose, a ripe pink color and incredible fruit flavors on the palate. It is a bit high on the alcohol content, as compared to many other Rosés, at 14%, but I think it is well balanced. It is not as dry as a French Rosé but not as sweet as some other California Rosés. It impressed me and I was sure to buy some. As an added bonus, this Rosé won't be officially on the market until August but Grapevine Travelers was able to get a limited supply now! So rush down there to get some before they sell out, which will likely be soon. 2007 Coturri Sauvignon Blanc ($24.99): This is also a new addition to the Coturri portfolio. It is made from 75% Sauvignon Blanc and 25% Semillon. I very much liked this wine too. It had good fruit flavors, plenty of nice citrus but without a predominant grapefruit taste. It was smooth and crisp and definitely a summer pleaser. 2007 Verdad Albarino ($22.99): Verdad Winery is another one of my favorite wineries, a California winery that uses primarily Spanish grapes. Their Albarino was very good, a crisp wine with good fruit flavors and a touch of tartness. 2004 Chateau Bianca Pinot Noir ($20.99) is from Williamette, Oregon. Chateau Bianca is new to me and I learned that the wine is named after the wine maker's sister. This Pinot spent 24 months in French oak. This was a light colored Pinot that was very Burgundian in style. It was smooth and subtle with excellent fruit and a touch of earthiness. It had a decently long finish and was very satisfying. And at this price, this is an excellent value. You don't find many Pinots of this quality costing under $25. 2006 Chateau Bianca Vin De Glace Ice Wine ($18.99): This is an authentic ice wine made from 100% Chardonnay. This was a delicious wine, only mildly sweet, with a nice honey flavor. I liked that it was not cloyingly sweet. And at this price, this is another excellent value. Another winner from Chateau Bianca. 2006 Ferreiro Albarino ($27.99): Old vine, about 80 years old, Albarino from Rias Baixas, Spain. Good fruit but with more of a mineral taste, similar to Portuguese Alvarinho. 2007 Domaine Richou Rosé ($14.99): From Loire, France, this Rosé is made from the Gamay grape and it typical Old World style. It is dry with subtle fruit flavors of strawberry and raspberry. Very nice summer wine. 2007 Alois Lageder Lagrein Rosé ($18.99): From the Alto Adige, Italy, this is another very good Old World Style Rosé. Dry, subtle fruit and refreshing. 2005 Ascheri Pelaverga ($18.99): From the Piedmont, Italy, the grape in this wine is the rare Pelaverga. It is a light colored red wine with an excellent flavor of black cherry, raspberry and a touch of spice. It does have somewhat of a different, but good, taste from many other Italian wines though I could not pinpoint the exact flavor. There are some moderate tannins but they do not overwhelm. A good food wine as is typical of Italian wines. 2005 Frog's Leap Petite Sirah ($39.99): A biodynamic producer from California, Frog's Leap makes many very good wines. This Petite Sirah is a big, muscular wine with plenty of lush dark fruit and strong spice. Though the alcohol content is only 14.2% which is low compared to many other Petite Sirahs. Grill up a nice steak and quaff down this big, bold wine. 2006 L'Ancienne Mercerie ($14.99): This wine is from the Languedoc, France, and is a blend of Grenache and Carignane. This was an interesting wine that seemed different from the usual. It had good dark fruit flavors with a touch of spice, vanilla and leather. It was a fairly complex wine for this price point and definitely worth checking out. They had an all Portuguese line-up which delighted me as I think wines from Portugal are very underrated and are often excellent values. And Aidil had what I feel was the top value wine of the tasting. 2007 Muralhas Vinho Verde ($12.99): This wine was a little effervescent with nice citrus flavors and only a touch of minerality. A clean, crisp taste that makes an excellent summer wine. 2006 Conde De Vimioso ($10.99): This was the top value wine of the tasting! A dark red wine with an alluring fruity nose. On the palate, there are ripe plum and blueberry flavors with spicy notes. It is a smooth, easy drinking wine with plenty of character. It is more of an elegant wine rather than just some fruitbomb. At this price, this wine is an exceptional buy. Would make a great BBQ wine this summer, as well as a wine for all year round. 2005 Esporao Reserve Red ($22.99): A spicier wine with more subtle, dark fruit flavors. More complexity and a longer finish. Another very good choice. The "spirit" of the Belmont Stakes is The Belmont Breeze, a refreshing cocktail created by New York City master mixologist, Dale DeGroff, a founder and president of The Museum of the American Cocktail due to open in New Orleans this summer. The Belmont Breeze is the official cocktail for horse racing's Belmont Stakes, the oldest of the Triple Crown races. "I created this cocktail to honor the tradition of whisky and mint drinks at the racetrack", says Dale DeGroff, inventor of the "Belmont Breeze". The cocktail has since become the signature drink of the Belmont Stakes. A secret ingredient? Dry Sack, one of the world's finest and most versatile sherries from Spain, It has a fragrant bouquet and a light yet satisfying taste that is neither too dry nor too sweet. "Historically, the racetrack was home to the fine cocktail. Whiskies and sherries were traditional ingredients used in the punches that were served in 19th century racing," said DeGroff. Dry Sack was first produced in 1905 from the award-winning Williams & Humbert winery in Jerez, Spain. It is a blend of the finest Oloroso and Pedro Ximenez grapes and is aged for six years under the authentic Spanish Solera System of blending. Dry Sack is the perfect aperitif - priming the palate without overwhelming the senses. Best served chilled in a wine glass, or on the rocks in a short tumbler. Dry Sack is 19.5% alcohol by volume and is available in 750ml bottles. Average retail price $14.99. Dry Sack is imported by Kindred Spirits of North America, Inc., Miami. The theme for Wine Blogging Wednesday #46 has now been announced and Dr. Debs of Good Wine Under $20 is this month's host. The theme this month is Rhone Whites. The classic Rhone white grapes include: Bourbolenc, Clairette Blanc, Grenache Blanc, Marsanne, Muscat Blanc a Petits Grains, Picardin, Picpoul, Roussanne, Ugni Blanc, and Viognier. All of these grapes can make some very different style wines. These grapes are often blended together and blends are fine for the theme. You don't have to choose wines made in the Rhone region though. Rhone grapes are grown in many other parts of the world and you can choose any of those wines for WBW #46 as well. Maybe you can try a Marsanne from California or a Viognier from Australia. And, if you taste wines from more than one region you'll get top billing in the roundup. On or before Wednesday, June 11, post your tasting notes on your blog, on the Wine Blogging Wednesday community site, or in the comments here at Good Wine Under $20. Please email Dr. Debs at goodwineunder20 (at) gmail.com with a link to your post after you make it. For more information about Rhone grapes, check out Dr. Deb's WBW #46 Announcement post which has several good links for more information. We had lots of participating for WBW #45, so let us hope that we get even more for this month's theme! Also be sure to read the June 2008 issue of Wine & Spirits magazine as it has an article written by Dr. Debs! On May 15, the Lower Falls Wine Co. held a special wine tasting with Ferdinando Zanusso of I Clivi, who makes organic wines from the Friuli region of Italy. Eileen of Adonna Imports was there too, as they are the local distributor for the I Clivi wines. "I Clivi wines are produced from old vines grown in ancient vineyard parcels in Friuli, the small "ear" that juts out from the Northeast corner of Italy. Ferdinando practices organic farming, low yield cultivation and minimal cellar intervention to allow the land to speak directly through the wines. His total production is only 2000 cases and he is committed to releasing the wines only when they have achieved sufficient maturity. The results of this passionate, nurturing, land-based approach are wines of gorgeous purity and finesse." For more information on I Clivi, you can check out their website. You can also check out articles in Mondosapore and Oenologic. I found Ferdinando to be almost shy, or at least very humble about his wines. Though when he did speak, his passion was evident. I think that maybe he prefers the wines to speak for themselves. We began the tasting with a 2002 Clivi Brazan Bianco. This wine is mostly made from Tocai Friuliano and a small portion of Malvasia Istrianna. The vines are at least 60 years old and the wine sees no oak at all. It is a low production wine and made organically. The wine had a nice yellow color with a nose of spice. On the palate, the spice notes predominated though there were subtle fruit flavors flowing through the taste. It had good acidity and definitely would be an excellent food wine. With the spicy notes, it is a more unique white wine, rather than the same old citrus flavors you get in many other whites. Next up was a vertical tasting of the Clivi Galea Bianco, including 2003, 2002, 1999 and 1997. The 2003 Clivi Galea Bianco is mostly made from Tocai Friuliano and a small portion of Verduzzo. Like the Brazan, the vines are old, generally 40-60 years, and the wine sees no oak at all. It is a low production wine and made organically. The wine also had a very bright yellow color though the nose gave more of a honey smell. On the palate, the wine was dry and the honey flavors predominated though they were more subtle. There was some spicy notes as well mixing with the honey. It had a long, lingering finish and I was very impressed with this wine. It certainly had character. The 2002 Clivi Galea Bianco comes from a bit of a cooler vintage. So, it was a bit fuller in the mouth and I found more mineral notes in the wine, mixing with the honey flavors. The honey flavors were a bit stronger than in the 2003. The honey flavors only gave it a hint of sweetness. Definitely nothing cloyingly sweet. It was very interesting to see the differences in the vintages. I very much enjoyed this wine as well. The 1999 Clivi Galea Bianco was my favorite wine of the tasting. The weather was similar in this vintage to 2003 though they used a bit less Tocai in the 1999. This is a more concentrated wine, full bodied with lots of delightful honey notes, a touch of spice and even a bit of minerality. A very complex wine that just tantalizes your palate. This would make a great pairing with foie gras. This wine, as will all of these whites, should last at least twenty years. I had to buy a couple bottles of this wine. I was not as impressed with the 1997 Clivi Galea Bianco. It came from an ordinary vintage, nothing unusual about it I found this to have a bit of a musty nose though that did not extend to its taste. On the palate, it was a dry wine with some honey and minerality but it seemed maybe a bit tight and restrained. It may have needed time ot breathe to fully appreciate it. It was a decently tasting wine but I don't think it was showing its true potential. We ended the tasting with the 2000 Clivi Galea Rosso. This wine is 100% Merlot from vines that are 50-60 years old. It sees some aging in used French oak. This was certainly one of the better Merlots I have had in quite some time. It was smooth with bright cherry flavors enhanced by a touch of spice. Another wine with character that elevates it above the usual suspects. If you enjoy Merlot, then you definitely should check out this wine. Once again, Lower Falls and Adonna Imports have put on an excellent wine tasting of delicious and unique wines. I definitely recommend you check out I Clivi wines! Kappy's Fine Wine & Spirits on Rt. 1 in Malden recently hosted a Burgundy Tasting with the wines of Alex Gambal. Alex, who was born in Washington D.C., traveled to Burgundy in 1993. He found a great passion for this wine and eventually created a négociant-éleveur business. He currently vinifies about 90% of the wines he bottles. His portfolio of wines range from regional AOC to Grands Crus AOC. The wines are produced from either Pinot Noir or Chardonnay grown in the Côte de Beaune and Côte de Nuits. They will not produce more than 5,000 cases in any year in order to maintain a high level of quality, to preserve their mission, and remain humble and respectful of the land. All of the wines are made in an artisanal manner in small lots by hand. They bottle by gravity without fining or filtering our reds and only lightly fining our whites. You can find some more detailed information on Alex Gambal, plus tasting notes, in the May 31, 2008 issue of Wine Spectator, their Special Report on Burgundy. I tasted five of his wines at the tasting. There would have been more wines available but there had been some shipping problems in France. Alex did mention that the 2005 wines probably needed at least five years of cellaring before they were ready to drink. The 2006 wines though were more ready to be drank now though they would also cellar well for a long time. First up was the 2004 Bourgogne Chardonnay "Cuvée Prestige" ($32.99). This was a very good wine with lush fruit flavors, especially peach. It also had some touches of minerality and a very nice crispness. A typical Old World style Chardonnay where the oak only enhances the wine rather than overpowers it. Next was the 2006 Puligny-Montrachet 1er Cru Folatieres ($116.99). This was a very good vintage for Puligny. This wine is made from old vines and vinified in 20% new oak. Lemons are the predominant flavor on this wine, along with a streak of minerality. This wine has good acidity and a very long finish. The 2005 Bourgogne Pinot Noir "Cuvee les Deux Papis" ($28.99) was made from grapes from their own vines. They had bought parcels in Montpoulain, Condemaine, Longbois and Les Petits Prés (which was classified as Volnay Village before the AOC.). Only 850 cases of this wine were made and it was vinified with about 10% new oak. This wine had a light red color with a pleasant nose of dark berries. On the palate, there was plenty of delicious fruit, dark cherry and raspberry, plus a touch of spice, maybe some cinnamon. It had a decently long finish and was an excellent example of Old Style Burgundy. I very much enjoyed this wine. The 2006 Savigny les Beaune "Vieilles Vignes" ($35.99) was very light red in color and had a closed nose. I found the wine to be too tight and not as tannic as the '05 Pinot. It did not impress me but I would have liked to taste it after it sat and breathed for awhile. The last wine was the 2006 Chambolle-Musigny ($59.99). Only 100 cases of this wine were made and it saw 25% new oak. This was an exceptional wine with lots of complex flavors, lush fruit and an amazing nose. A hedonistic effort that will only get better with time. The Bedford Village Inn & Restaurant is hosting their 2008 Chefs Invitational Series, six months of fine dining events presided over by six distinguished chefs. For the past eight years, their Chefs Invitational Series have showcased a roster of highly acclaimed chefs representing an eclectic range of cooking styles. This year’s chefs will prepare recipes spanning Cajun to French to Mediterranean-Asian influences. The inn’s eight dining rooms typically offer New England cuisine. From June through November, one guest chef per month will join Bedford Village's Executive Chef Peter Agostinelli in the elegant Overlook Room for four-course, $85 prix fixe dinners with wines culled from the inn’s Wine Spectator Award of Excellence-winning cellar. Menus are available online. Here is the schedule of Chefs. Tucker brings considerable experience and versatility to this two-year-old Italian restaurant owned by Boston Bruins hockey legend Ray Bourque. A self taught chef with a degree in English Literature from Skidmore, Tucker left the world of words behind to pursue his love of food. He helped Todd English launch his Figs concept, then worked as sous chef for five years at the intimate and acclaimed Trattoria Scalinatella in Boston’s North End. At Tresca, Jason’s menu spans the regions of Tuscany, Marche, Sicily, Sardinia and more, blending traditional Italian recipes with modern technique, while vintage Italian wines are poured. Pastas are handmade and fish is fresh from east coast waters. Bajeux is one of the 50 French Master Chefs in the U.S., as designated by the prestigious Maitre Cuisinier de France fraternity. Raised on a farm in France, he earned a culinary degree, then fulfilled his mandatory military service as a cook in the French navy, and made his way to America via Montreal. He worked at two renowned Four Seasons properties, in Hawaii and in Beverly Hills, before moving to New Orleans in 1997 to take command at The Windsor Court Hotel’s Grill Room. In 2001, Bejeux opened René Bistrot, a haven of authentic French cooking in downtown New Orleans. Esquire Magazine named it among its “Best New Restaurants.” Last year, Bajeux took over the kitchen of La Provence, a dining destination that’s been well worth the hour’s drive from New Orleans since 1971. Its menu reflects old world techniques and earthy ingredients. It is the perfect showcase for Bejeux’s talent and agricultural background. This chef understands terroir cooking and believes that chefs should be physically connected to the food they serve. Jantz was born in Japan, raised in Germany, and received his culinary degree in Kansas. His earliest job was in a restaurant specializing in game, where he cooked with exotic meats procured from around the world. Soon after, Jantz took off for years of globe-hopping and backpacking, working in kitchens in Switzerland, the Antilles islands and finally at The Royal Sonesta Hotel in New Orleans. In 2003, he was named Executive Chef at Trump International Hotel in Miami. Jantz’s menu is a composite of his travels, his technical experiments, and his ventures in ethnic cuisine. This year, Jantz was awarded the "Rising Star Hotel Chef" award for South Florida. Some of the most favored dishes in all of N’awlins – simple yet innovative and true to their roots -- come from Link’s kitchen at Herbsaint, which he opened after study and a brief stint on the west coast. Inspired as a child by his grandfather's Louisiana cooking, Link has operated out of the city’s Warehouse District since 2000. Two years ago, Link opened Cochon, an authentic Cajun/Southern restaurant featuring the foods and cooking techniques that he grew up making and eating. In 2007, The James Beard Foundation named Link "Best Chef: South" and nominated Cochon for "Best New Restaurant." A self-taught chef inspired by the historical cuisine and agricultural traditions of Italy, Polegri learned about the relationship between farmers and consumers by running his family’s farm and vineyard. Before becoming a chef, he managed a national farmers' trade union, and led courses in production, economics and marketing for other farmers. In 1990, Polegri jumped into the restaurant business with his first place, Funky, in Orvieto’s old town center. A few years later, he opened Wunderbar Café. After gaining a bit more varied cooking experience in Greece, Polegri returned to Orvieto in 1995 and opened Zeppelin in a 16th century building there. The cuisine is local yet experimental. In 2000, Polegri and his wife opened Instituto di Arte Culinaria Marchesa Adele Viti, a school where he teaches the cooking techniques and food traditions of Orvieto. For reservations and more information, call the Bedford Village Inn at 800-852-1166 or 603-472-2001 or visit them online. What is Your Virtual Water Footprint? There is much discussion lately about carbon footprints and how we can help to try to reduce climate change. This is also a topic of some controversy, especially over the amount of potential harm that will occur in the near future. Yet much of that harm remains potential. We don't have millions of people currently dying because of climate change. But are we concentrating more on trying to prevent potential harms and ignoring actual harms that are occurring now? Do you know what is a virtual water footprint? Have you seen much discussion on this topic? Before a few days ago, I was unfamiliar with the term and don't recall seeing any prior discussions on this matter. Yet it may be just as important, if not more, than carbon footprints and far less controversial. Discover magazine (June 2008) has an article titled “Virtual Water-A Smarter Way to Think About How Much H2O You Use” by Thomas M. Kostigen. It raises some compelling questions about water use. Let us start with a disturbing fact. Up to 5 million people die each year from lack of water or water-related illness. That is a clear and immediate harm that should be addressed. Fresh water is a limited resource and there are many countries with significant water shortages. If we waste water, that impacts the rest of the world. So what is a virtual water footprint? “Virtual water is a calculation of the water needed for the production of any product from start to finish.” (p.22) So let us consider some examples. A 5 ounce glass of wine has a virtual water footprint of 38 gallons. A banana is 27 gallons, a slice of bread is 10 gallons, and a 12 ounce glass of beer is 28 gallons. This applies to non-food products as well. For example, a pair of leather shows has a footprint of 4400 gallons. Agriculture though accounts for about 70% of all water use in the world. The average person has a total virtual water footprint of about 328,140 gallons each year. But, the average for the United States is 656,012 gallons, the largest on the planet. You can go to Water Footprint and estimate your own virtual water footprint. They also have more reading material concerning these issues. Scientists estimate that we must increase our water supply by 14-17% by 2030 just to meet dietary needs. The only way to do that is to conserve our virtual water footprint. Did you know that we currently lose 30-50% of the food we grow and all the virtual water in it, by the time it is ready for consumption. These losses occur in harvesting, production, processing, transportation, and storage. Plus we must consider all those leftovers that get tossed out. We can all take steps to reduce wasteful water use and reduce our virtual water footprint. Just consider how much food and drink you may throw away. The Water Footprint website has many other suggestions. But there are larger questions as well. Why is your carbon footprint so prevalent in the news yet the virtual water footprint gets so little press? Is climate change just more fashionable a cause, allowing us to ignore a problem that leads to almost 5 million deaths a year? Are we asking wine makers about their water conservation methods? Are we asking our farmers about it? If you want to be carbon neutral, do you also want to be water neutral? I recommend you read the Discover article as well as check out Water Footprint. It will raise your awareness of this issue. Pellana, a high-end steak house in Peabody, is hosting another wine dinner on Monday, June 26, 2008, at 6pm. This dinner is being presented by the Pellana Wine Director, Nick Grimshaw & Brian Lamb, owner of the OurGlass Wine Co. in Saugus. The wine dinner costs $125 per person (excluding taxes and gratuities). Limited Seating Available. To reserve your seat, you can e-mail Nick Grimshaw, Pellana Wine Director, at ngrimshaw@pellanarestaurant.com or call Nick or Daniella LaRosa, Pellana Operations Manager, at 978-531-4800. Is any bottle of wine worth $156,000? Would it matter whether the wine was still drinkable? Or is its mere historical importance sufficient for such a price? While pondering those questions, you might want to read a new book that addresses those issues. The Billionaire’s Vinegar by Benjamin Wallace is published Crown Publishing Group, a division of Random House. The Billionaire’s Vinegar is a new hardcover, with 304 pages and twenty chapters. A cache of eighteenth century wines, allegedly owned by Thomas Jefferson, were supposedly found in a cellar in Paris. But were they authentic? Were they actually owned by Jefferson? This book explores the history and controversy behind this intriguing mystery. It is a fascinating story with colorful characters. The story covers many matters, such as a history of Jefferson and his wines and an auction of one of the bottles, an auction that created a record sale for a single bottle of wine. The colorful characters include individuals such as Michael Broadbent, wine expert and auctioneer, Marvin Shanken, publisher of Wine Spectator, Malcolm Forbes, wealthy publisher, and Hardy Rodenstock, the owner of the Jefferson bottles. It also includes such well known personalities as Robert Parker and Jancis Robinson. Yet it is more than a history book. It also describes an elite culture of wealthy wine aficionados who regularly drink some of the oldest and most expensive wines in the world. This is a realm into which most of us will never participate. These are men who routinely drink wines from the nineteenth century, and sometimes even the eighteenth. It is also a world of one-upmanship, where these wine collectors continually try to top each other. It is also a book about counterfeit wines, how it is done and how it sometimes can be detected. There is the possibility that some of the biggest names in the wine world may have been fooled by counterfeit wines. Some of their tasting notes may be tainted, based on revieweing counterfeit wines. At the center of the counterfeit allegations stands Hardy Rodenstock. He has been accused of selling numerous counterfeits, including the Jeffersonian bottles. Yet he has his defenders as well. What is the truth, are the Jeffersonian wines counterfeit or not? This was a very enjoyable read, a well written book that held my interest to the very end. A mesmerizing mystery that unfolds and provides a fascinating glimpse into a world few of us inhabit. It also presents a balanced picture of the issues involved. I would recommend this book to all wine lovers or those who just want an interesting read. One interesting factoid from the book was the mention of a 1980 poll which found that 23% of the wine drank in the U.S. was on the rocks. Wine on ice? Hopefully those numbers have changed by now though I do know a few people who still drink their wine on the rocks. Over the weekend, my Saturday evening dinner plans were canceled as someone was ill. So, a bit at the last minute, I wanted to make plans elsewhere. It can be difficult on Saturday morning to try to make plans for later that evening. I had a craving for French food and was able to get a reservation at Sandrine's Bistro in Harvard Square. I have discussed and reviewed Sandrine's Bistro before. But it always seemed that I had been there for lunch or weekend brunch. Never for dinner. I had very much enjoyed my meals there and felt that dinner would be just as good. The restaurant has a very comfortable ambiance with a touch of elegance. There was an eclectic crowd, from college students to older couples. It was busy though not overly crowded, but then it also was the night before Mother's Day. I suspect this place gets very busy on most weekends. They even have a bar where you can sit, have a drink and a bite to eat. The dinner menu has Appetizers (about $12-22), Soups ($10), Salads ($9-16) and Entrees ($19-36). There were also several specials available. We decided to go with the Chef's Degustation Menu, a five-course tasting menu for $65 per person. This menu changes frequently. We declined the wine accompaniement (an extra $35 per person) as we were going to order a bottle ourselves. I ordered a bottle of the 2005 Domaine Chanson Pere et Fils Gevrey-Chambertin ($74). Most of the French Burgundy on their list was from the excellent 2005 vintage. This wine generally sells around $55 retail so the restaurant has a very low mark-up on this wine. And it was quite a delicious wine, typical Burgundy style with delicious subtle fruit, a touch of spice and a very long finish. It also paired quite well with most of our dinner. I do have to note though that our server recommended the 2005 Aloxe Corton, Domaine Tollot-Beaut ($85). He stated it was a new addition to the list. This happened to be the most expensive Burgundy on the list. And our server knew nothing about what type of wine we were considering ordering, or what price range with which we were comfortable. I don't like unsolicited recommendations when it happens to be the most expensive item on a list. It seems to be much like blatant upselling. Prior to our first course arriving, we received a basket of bread including warm baguette slices and some raisen bread. Both breads were very good and this made for a nice beginning to our dinner. Our first course was a Foie Gras Terrine atop Brioche with fruit. The Terrine was very tasty, spreading nicely over the Brioche toast. There were some berries, apricot and possibly some mincemeat accompanying it. The next course was one of their appetizer specials, Avocado with Lobster. This was a half an avocado, with a bit scooped out, and filled with lobster pieces and topped by a citrus sauce. There were plenty of lobster meat and the citrus sauce was very interesting. I enjoyed the filling but am not an avocado fan. My wife though thought the avocadoes were delicious. For our entree, we had the Smoked Paprika & Curry Dusted Rack of Lamb. This is in a roasted garlic-plum tomato reduction and is accompanied by roasted long stem artichokes and fingerling potatoes. I am a big fan of lamb and this dish certainly delighted me. The lamb was very meaty and tender. It had a nice spicy flavor from the curry. The potatoes were tiny and very good as well. This entree is on the regular menu and I would highly recommend it. Next up, a cheese plate. There were three different cheeses on the plate, an ash-covered goat cheese with honey, a potato and cheese ball, and a Muenster-like cheese with fruit compote. I did not get the exact names of these cheeses. They were served with a basket of assorted breads. And the cheeses were exceptional. Creamy, flavorful, unusual. So very very good. I loved every one of them and left not a crumb. The goat cheese with the honey was especially delicious. The cheese plate is on their dessert menu and I would also highly recommend that choice too. Yet dessert was still coming. And we were already starting to feel rather full. For dessert, we could choose anything from the menu. Though it was tempting to order the cheese dish again, I went for the Chocolate Kugelhoff (which is probably not the correct name but it is close enough). This was a large, moist chocolate cake, topped by caramel coulis and vanilla ice cream. A decadent delight that I could not entirely finish. But I enjoyed every bite I was able to eat. My wife had the Ginger-Bread Pudding though they made a mistake and brought her creme brulee instead. We sent the brulee back, though that meant my wife had to wait a bit for her dessert. Service was generally good though with the couple issues that I mentioned above. The food was delicious and the Degustation Menu was a good choice. You certainly get plenty of food and it is an excellent way to get to try several different dishes. I have previously recommended Sandrine's Bistro for lunch and brunch. Now I do so for dinner as well. Spanish Wine Educator's Course: Passed!